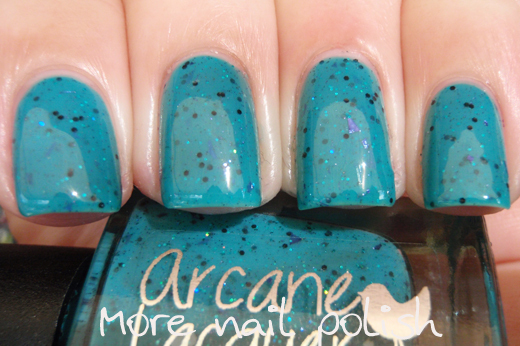 Bec just released her second collection of ten polishes. This new collection is very cool. 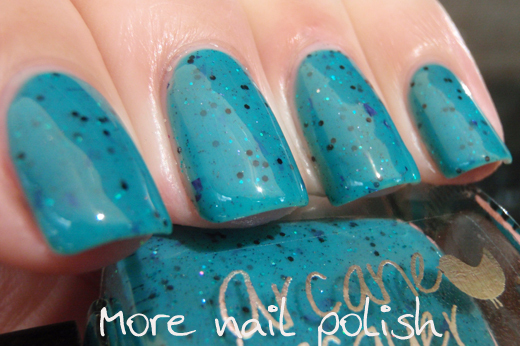 I say that because all the polishes are cool tones. There's not a pink, red or orange in sight. I love cool colours, so this collection is right up my alley. I have five of the ten shades to share with you, so lets check them out. Busy Body - teal jelly base with a mix of black and purple hexes with a few turquoise hexes and purple shreds. Fantastic formula, smooth and easy to apply. I did three thin coats with Seche Vite top coat. 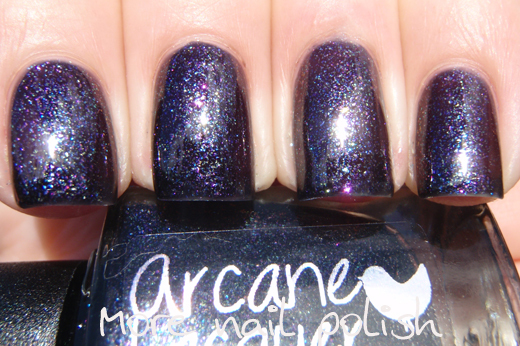 Erudite Charm - Cornflower blue creme with a purple shimmer and black and periwinkle blue hexes with a scattering of gold, bronze and copper glitter. 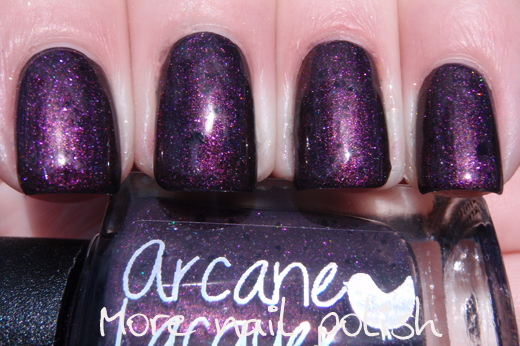 Smooth and easy to apply and the purple shimmer really pops in the sun. 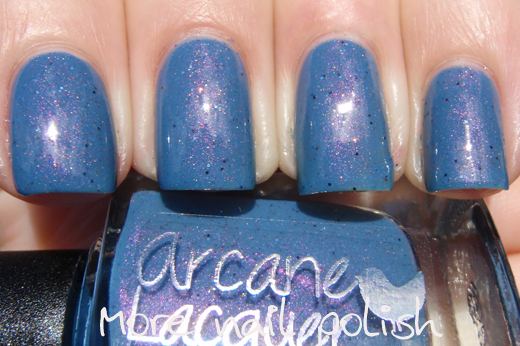 This is three coats with Seche Vite. 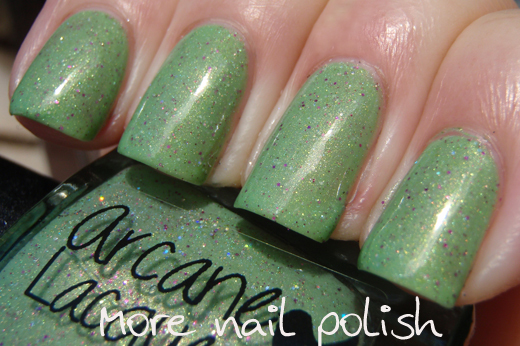 Little Quibble - Light green with a gold shimmer, silver holo flake and hexes and small fuchsia hexes. 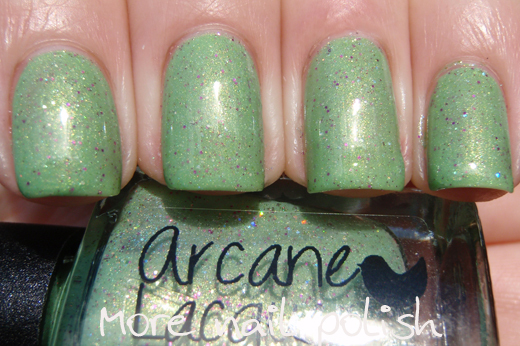 My bottle and swatches look a lot paler than the bottle shots and swatches on the Arcane Etsy site. I'm pretty happy with the colour accuracy of mine, so maybe there is some batch differences? 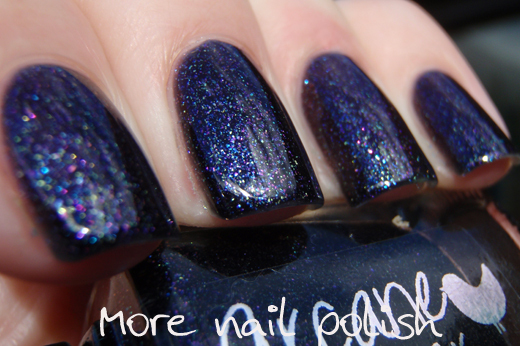 This is three coats with Seche Vite top coat. No Way Tawdry - a black jelly base with colour shifting microflakes in lots of different colours. The flakes in this are like the ones in the Ozotic Sugar and beam collection, except this is obviously mixed in a black jelly base. The first photo shows it in the sun, the others are in the shade. This was three coats with Seche Vite. Repeat Caveat - When I first swatched this one, I hadn't read that it was designed for layering, so I first did it on it's own. This was three coats, and it nearly reaches opacity. I like it on it's own cause you can see the black hexes and shards so easily. Repeat Caveat over black - now the magenta shimmer really pops. 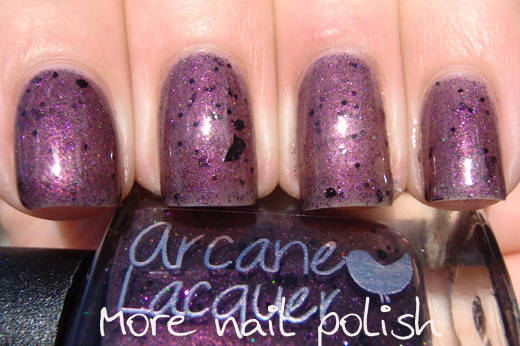 Arcane Lacquer is having a flash sale right now through to Friday this week. If you enter the code 'Flashsale' you will get 15% off storewide for purchases over $30. 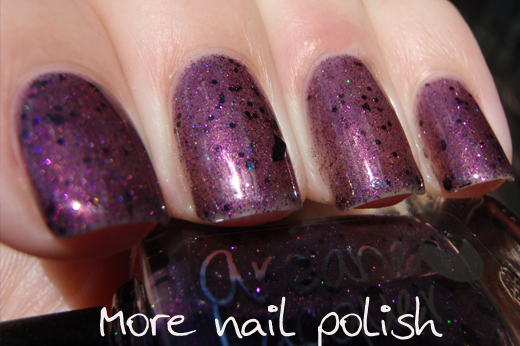 Check out the Arcane facebook page or browse the polishes on the Etsy store. Your swatches look amazing, thank you!! Wow! I'm loving Busy Body and Repeat Cavet! So pretty! Great swatches. No Way Tawdry is so pretty!